HARTFORD, CT- In a bombastic 5 set match Thursday night, the United States Coast Guard Academy Bears topped the Trinity Bantams on Dig Pink night in Hartford. 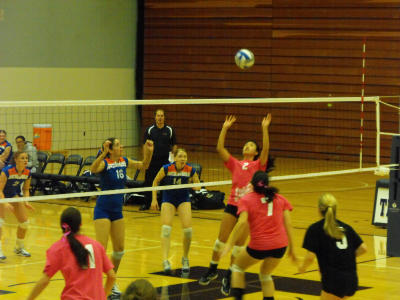 Dig Pink was set up to support breast cancer research and awareness. Editor’s Note: As is the case with all my reports, the offensive efforts are the most straightforward to chronicle as they directly result in points, however this does not diminish the defensive efforts, and the assists that set up the offensive plays, they are just much harder to follow. They are noted when possible. It’s a team game with everyone on the floor playing a key role. USCG picked up the 25 to 19 win in Set 1. Highlights for the Bears included Kelsey DePorto’s opening kill, soon after Catherine Walker whacked through the ball through the block, Lauren Bloch crushed an attack right afterward, and later added a cross court kill just in bounds,she added a missile not long after, and Jessica Anderson teed up a service ace, before another Bloch blast, Walker than added a kill, she then sent another kill to the back corner as well, and added a spike, a few points later DePorto and Keriann Mason added a block, Mason followed that by knocking the ball of the blockers, and another kill, followed soon after by another kill from the net, and Walker tapped one over for the next to last point of the set before they took the set. Highlights for the Bantams included after a few early points, Danielle Isaman tapped to the gap, later Kristen Anderson delivered a kill, Kelly O’Brien came up with a block, Isaman stuck again right afterward, and after a few USCG points she picked up another attack, later Anderson had a mid court whap off the defense, later Hannah Brickley ended a long back and forth with a cross court attack, and another rocket immediately after, Anderson set the ball over the defense, this was followed by a service ace from her, later Brickley sent another kill into the gap, she would have one of the later Trinity points in the waning moments of the set. In Set 2, USCG took it with a 25-14 win. Highlights for the Bears included the set opening with a Walker blocked followed by a tap in, a Bloch blast, and another Walker kill, later Bloch let loose a rocket, Jessica Anderson came up with a good defensive save but Trinity took the points, Bloch added a tap, Mason had a cross court kill, Rachel Cuthrell picked up a kill off the block, Walker came up big again, and again not long after, then came DePorto receiving a set and whisking it in, Walker whacked the ball through the block, Bloch added a kill, DePorto came up with a kill, Bloch added a kill, as did DePorto, and the two shared a block after that, Sam Marmolejo had a good save though Trinity picked up a point, Mason had an attack, and the set was won soon after. And for the Bantams, Sarah Blagden’s service ace came early in the set, Isaman crushed another kill over, then another kill from her went into the corner, a great save by Blagden unfortunately didn’t result in any points, Anderson than tapped the ball over the block to the floor, Brickley added a kill just within the lines, Anderson adds a kill to the back corner, Isaman came up with a block, Anderson sent in three straight kills late in the set which would account for the rest of the Trinity scoring. In Set 3, Trinity kept alive with a 25-15 win. Highlights for the Bantams included Anderson’s early attack, followed by Isaman and Kelly O’Brien’s block, not long after came another Anderson kill, and Isaman’s cross court spike, which she augmented with a blast for the next point, a few points later her cross court ball landed just in play, Brickley typhooned an attack and attacked again for another point. Alexandra Pell got in on the scoring with a whack to the corner, and again added a spike not long after, O’Brien received a set and just furiously whammed it over, Brickley won a joust at the net, and added a kill after that, Anderson served up a spike, Isaman added two kills, and she also had the next to last kill of the set which she walloped the ball into the Coast Guard zone, the set ended with Brickley’s tap to the gap. For USCG, Walker had the first point of the set and Mason was second up, Block sent another speeding bullet of an attack over, a great save by Mason did not lead to a point however, Block hit a huge kill to keep the team in it as Trinity was rolling, she also had a service ace during their comeback, Rachel Cuthrell sent the ball off the defense and out of bounds, and the team benefited from 4 successive Trinity errors to pull within 1. DePorto kept them within 1 before the Bantams started streaking again, Walker hit another kill late, but Trinity just kept going. In the close Set 4, Trinity narrowly edged the USCG 25-22 to get to set 5. Highlights for Trinity included Pell’s jumping tap to gap, Isaman hitting it over again, Anderson big kill, Jennifer Low added a one handed misdirection in, Pell had a cross court attack, good save by Pell, a spike just in bounds by O’Brien, Pell added two more kills, O’Brien put down an overpass, then teamed with Anderson on a block, later Anderson’s major spike hit a defender and ricocheted into the seats, she then struck again followed by Isaman receiving a set and blasting it down the line, shed added another kill not long after and a speedy slashing spike in after that, she also came up with another big time spike off a set for the 21st point, Brickley whipped in an attack, and Isaman served up an Ace, a couple USCG errors then put them over the top. And for the Coast Guard, DePorto opened the set, Bloch followed, Walker hit the ball off the blockers, DePorto and Bloch had a tandem block, later Mason crushed an attack and had a service ace, Mason added a big kill, Bloch crushed it, then added a whack, followed by DePorto, Ashley Bullard set the ball to the gap for a point, Mason landed a kill just in bounds, Bloch added a huge spike, and Bloch struck again, and Merritt Anderson then hit off the block, Cuthrell added a kill late off the defenders though that would be the last USCG point. The decisive set 5 would go the way of the Coast Guard with the Bears picking up a 15-10 win. For the winning USCG, Merritt Anderson had a block, DePorto scored early, Bloch hit one through the block, Mason turned and whipped a kill in, Mason added a kill, and DePorto was scoring as well, a par of errors put them up 10 to 2, Mason uncorked another blast, Bloch and Cuthrell shared a block, Merritt Anderson had a kill, Cuthrell hit to the gap, Bloch then nailed one to end the set. For Trinity in the effort, Isaman had an early kill, later during a long back and forth Blagden had a good save and Brickley eventually picked up a point, Isaman added one and yet another, Brickley and Low teamed up on a block, and their last point would come from an error.